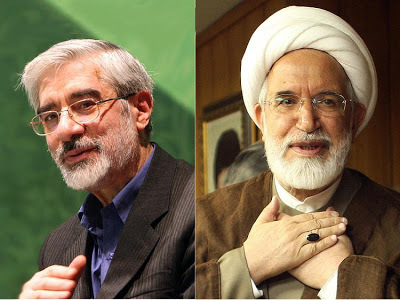 UPDATE: Golnaz Esfandiari, editor of Iran blog Persian Letters, twitted that a journalist close to opposition leader Mehdi Karroubi says that Mashreghnews report on lifting the house arrest of Karroubi and Mousavi is “a lie.” Esfandiari adds that the hardline websites have made similar false claims in the past. Lets get this clear,these people are REGIME SPONSORED "opposition leaders". They are not the real opposition against the theocracy of mullahs. Revolutions always end up consuming their children. It's all so blatantly Animal Farm. http://www.youtube.com/watch?v=2LQ6eUba0ho&NR=1&feature=fvwp --- BBC Mousavi report. http://www.youtube.com/watch?v=ILsi5lndCF8 --- BBC Special report on Mousavi. http://www.youtube.com/watch?v=9RcJIq8_VAI --- How France prevented arrest of Khomeini by Shapour Bakhtiar. Made by a propagandist of the Islamic regime.